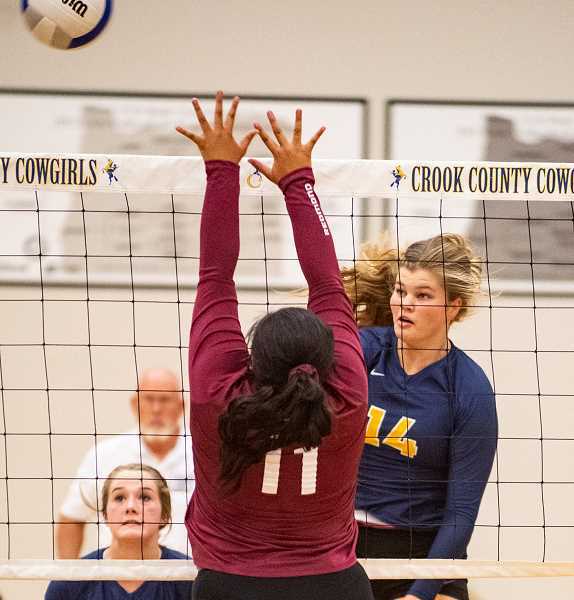 The Crook County Cowgirls are battling injuries, and it showed on Saturday as they struggled with consistency at the Mount Hood Invitational Volleyball Tournament, which was held at Sam Barlow High School in Gresham. The Cowgirls opened pool play with a 2 games to 1 loss to the Clackamas Cavaliers. "They were really tough," Crook County head coach Baylee Dunkel said of Clackamas. The Cowgirls rebounded from the loss to take a 2 games to 1 victory over the Philomath Warriors before closing out pool play with a 2 games to 0 sweep of the Gresham Gophers. "I got a lot of my bench in against Gresham," Dunkel said. "And we ran a true 6-2 with both Anna Woodward and Messina McClellan setting, and that was good." With the 2-1 record in pool play, the Cowgirls were seeded fifth for bracket play. Once in bracket play, Crook County took on the Sandy Pioneers, falling 25-20, 22-25, 15-13 in one of the closest matches of the tournament. "The team played amazing for what was going on," Dunkel said, speaking of the Cowgirl injury woes. Kerigan Waibel did not play at all in the tournament, while Liz Barker missed some time with a sprained ankle. Although she played, Lily Cooper was also recovering from an injury suffered Thursday in a home victory over Redmond. With the injuries, Dunkel used the day to experiment with her lineup. While Barker was out getting her ankle taped, freshman Josie Kasberger played some middle blocker, despite being just 5-7. Then, later in the match, Cooper moved from right side hitter to middle blocker. In addition, Dunkel put defensive specialist Kacie Stafford on the front row for a portion of the tournament. "I needed her enthusiasm and energy," Dunkel said of the decision. "She's kind of like the glue for our team right now, and the team rallied around that a lot, and they loved it. Kacie was on fire up front. I was really impressed for sure." Dunkel said that although she was disappointed with some of the inconsistency, she was pleased that no matter how she altered the lineup, the team continued to play hard. "I am proud of them for overcoming injuries and sickness," she said. "They are doing really well with the mismatched lineups." Dunkel was also pleased that the Cowgirls cut down on their service errors. Last Thursday, in a key league loss to Ridgeview, Crook County had 10 service errors. Saturday the team did much better, never having more than three in a match. "One thing that we have been working on is our serving errors," Dunkel said. "I think the most we had was three in one match, so I'm really proud of that." Crook County plays at The Dalles on Thursday, then will travel to Bend on Saturday for the Clearwater Classic. The Classic is held at Bend, Mountain View and Summit high schools and is considered the toughest tournament in the state each year. Pool play matches begin at 9 a.m. with bracket play beginning at approximately 1 p.m.